Editor’s Note: This is a review of the movie, not the TV series. Though The Killing was Stanley Kubrick’s third film, it was his first serious picture. His first two movies, Killer’s Kiss and Fear and Desire, are commonly called warm-ups for the director by movie critics (I haven’t seen either, which I plan to change soon, especially since Killer’s Kiss is a supplement of the DVD for The Killing). The Killing established Kubrick as one of Hollywood’s best directors, which he later cemented his reputation with Paths of Glory and by Dr. Strangelove and 2001: A Space Odyssey, he had established himself as a film titan. The Killing is a crime movie about Johnny Clay (Sterling Hayden), a criminal who is planning one last heist before he will marry his girlfriend Fay (Colleen Gray). He wants to rob two million dollars from a race track and assembles a team to help him do so. He gets a corrupt cop named Randy Kennan (Ted de Corsia), a betting window teller named George Peatty (Elisha Cook Jr.), a sharp shooter named Nikki Arane (Timothy Carey, who later went on to also star in Kubrick’s Paths of Glory), a wrestler named Maurice Oboukhoff (Kola Kwariani), and a bartender named Mike O’Reilly (Joe Sawyer). All of them perform different parts of the heist and none are given the full details of the plan. George tells his wife Sherry (Marie Windsor) about the robbery and promises to give her the money he said he would get her when they got married. What he doesn’t know is that Sherry is having an affair with another man named Val Cannon (Vince Edwards) and she plans for him to steal the money from George and the rest of the gang. While The Killing isn’t as known as Kubrick’s later projects like The Shining or A Clockwork Orange, it’s been quite influential in the world of cinema. Quentin Tarantino took inspiration for his movie Reservoir Dogs, and multiple other heist movies bare resemblance to The Killing. What’s quite extraordinary about The Killing is that it establishes a theme recurrent among Kubrick films. Unlike most directors, Kubrick has done a whole variety of movies in different genres, such as sci-fi (2001), horror (The Shining), comedy (Dr. Strangelove), and others. But all of his movies, with the exception of Spartacus, have demonstrated irony and themes of dehumanization and insanity. The Killing contains these themes as well and is Kubrickian to the core. The Killing also uses many of Kubrick’s other trademarks: his visual flare, his close-up shots that foreshadow omens, his attentiveness to detail. Although filmed on a very low budget, The Killing is visually more impressive than most blockbusters today. Kubrick doesn’t have the film move linearly but rather jump from time to time. He uses a narrator (an uncredited Art Gilmore) to give the context of a situation. This could have been executed badly but Stanley Kubrick does it perfectly here. It gives the film a sort of episodic feel to it. We see each member of the gang perform their part of the heist, making us feel like we are in the shoes of the character. We don’t know what’s happening elsewhere, all we know is what’s happening on screen. The casting of the movie is very strong, but the stand out of the movie has to be undoubtedly Elisha Cook Jr. Like Gomer Pyle in Full Metal Jacket, George starts out as an innocent bystander and ends up going insane. Elisha adds the intensity into his character that really helps push the film forward. 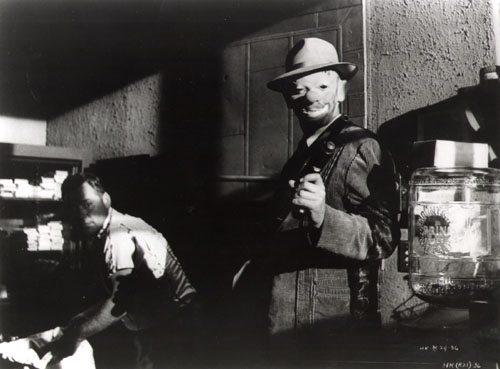 Overall, The Killing is another great movie by Stanley Kubrick. I’ve said before that he’s one of my favorite directors, perhaps my favorite, and he sure doesn’t disappoint here. The Killing is a great crime noir picture, one of those movies whose aura is completely gripping. It’s a true classic. Probably Stanley Kubrick’s Most Underrated Flick. It’s A True Classic Of The Genera, As You Said. Thanks! Either this or Barry Lyndon is Kubrick’s most underrated film. It’s a great piece of cinema that’s one of the best crime noir movies ever made. This is one I really have to watch again soon. It’s a great film. The Criterion Collection restoration is incredible. I looooove The Killing. Timothy Carey is so awesome. Great write-up! I was kind of let down by Killer’s Kiss. It has a lot of awesome moments, but it’s just kind of dull. I still have yet to watch my copy of Fear and Desire, though. Thank! Carey was great in Paths of Glory as well. I saw Killer’s Kiss a while ago and was disappointed as well. I need to buy a copy of Fear and Desire.